As you know, iATS Payments exists to serve the nonprofit space – and we’ve been doing so for over 20 years. But we feel there’s always more we can do, particularly in our own backyard. In Vancouver, British Columbia, Canada, where iATS Payments is located, commercial lease costs are some of the highest in the country. For many local nonprofits, access to affordable office space can be a challenge. You need cost-effective, flexible options to help you execute on your mission. With The Greenhouse, we hope to not only mitigate some of those fixed costs, but, as the name implies, offer a welcoming place to help nonprofits just like you grow. It's a co-working space dedicated to the nonprofit community, including registered nonprofits, nonprofit technology companies and consultants. It connects nonprofit organizations with short-term, flexible office space, 100% free of charge, and is a testament to our ongoing commitment to the nonprofit sector. 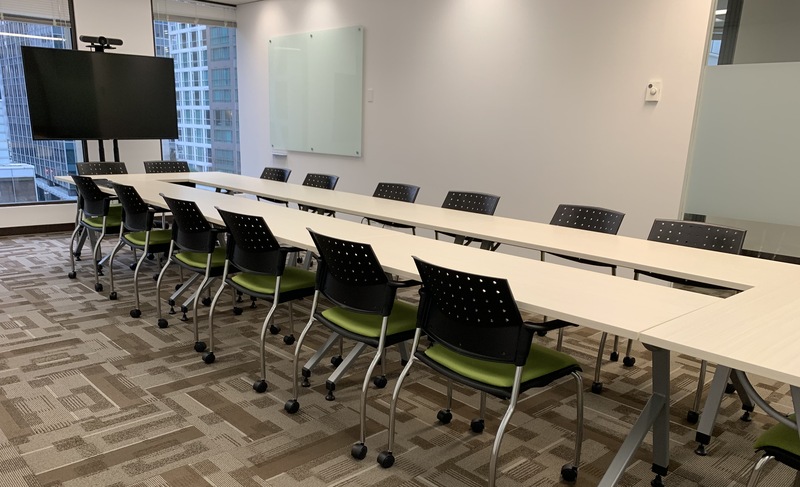 One of three available rooms in The Greenhouse, the boardroom offers a flexible, modular setup, with plenty of natural light, that can easily be converted for larger-group meetings or classroom-style events. Who is The Greenhouse for? Open to everyone in the nonprofit community, The Greenhouse is ideal for small to mid-size nonprofits looking for a flexible multi-purpose space. The Greenhouse offers three separate spaces, reservable on a daily basis. What can I use The Greenhouse for? Here are just a few ways that nonprofits will be using the space. How do I reserve The Greenhouse? First, take a moment to review our FAQ and Code of Conduct governing the use of The Greenhouse. Then, let us know what you're looking for by completing the form below. A member of the iATS Payments team will be in touch with you to review your requirements and confirm the reservation. Copyright © 2018 iATS, LLC. All rights reserved. iATS, LLC is a registered ISO of Wells Fargo Bank, N.A., Walnut Creek, CA. First Data Europe Limited (trading as First Data Merchant Solutions) and iATS, LLC are registered with MasterCard / Visa as an ISO. iATS, LLC is an agent of First Data Europe Limited. iATS is a registered ISO of Chase Paymentech Solutions. iATS is a registered ISO of Fifth Third Bank, Cincinnati, OH.